As Mayor Anotonio Villaraigosa graced a stage yesterday near two of my favorite downtown restaurants; DRAGO and CHAYA, he gave us his mega-watt smile. He comfortably faced a crowd of chefs, media and VIPs welcoming everyone to the 5th dineLA week starting on October 2-7 and 9-14. “dineLA is becoming tops in our city due to our diversity,” announced Villaraigosa. 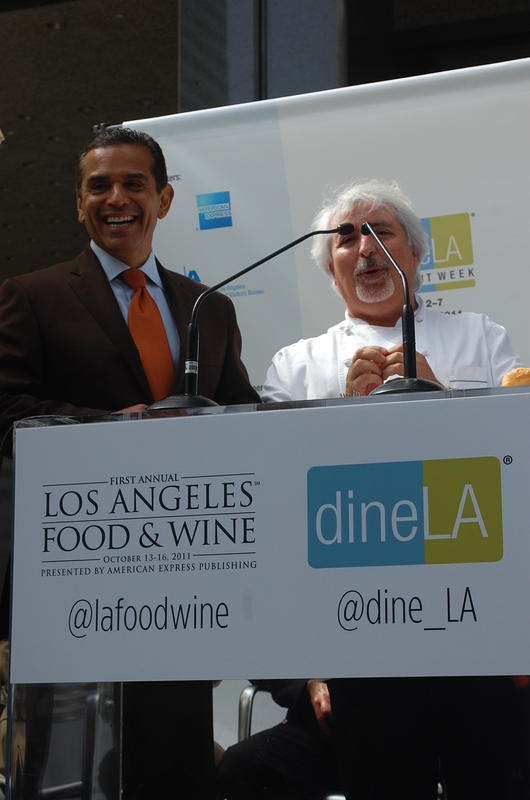 “Our chefs combine food from all over the world.” Mayor Villaraigosa enthusiastically revealed a new event to Los Angeles, the Food &Wine festival, with over 100 celebrity chefs, 300 wineries and 70 events from Santa Monica, Beverly Hills, Downtown LA and Hollywood. “Los Angeles used to be second, third, fourth or fifth in the culinary world, behind New York and San Francisco. Now we are becoming #1,” enthused Villaraigosa. “This event demonstrates the strength of our culinary community.” dineLA brings in about $6.2 million to the city of Los Angeles. 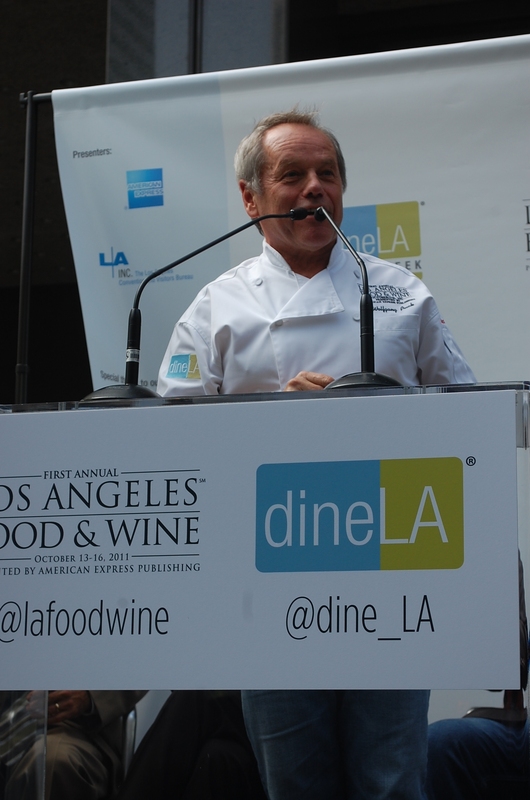 The Mayor introduced celebrity chef, Wolfgang Puck, to the podium to discuss more about the Los Angeles Food & Wine festival on October 13 -16. “Mayor, with your smile and ease shaking people’s hands, when you are finished with your term as Mayor of our city and after you are Governor, will you please be a maitre d’ at one of my restaurants?” solicited Puck. As the crowd laughed, Puck shared that the first restaurant he worked at was three floors below where we were seated. Puck is extremely excited to bring the Food & Wine event from Pebble Beach, CA to Los Angeles. The hope is to bring an additional $4.9 million impact to our city. With 70 events ranging from wine tastings to intimate dinners with celebrity chefs and a Wolfgang Puck Sunday brunch at the newly re-opened Hotel Bel-Air. All the proceeds from the tickets will go to the Saint Vincent Meals on Wheels foundation. Puck has been involved with this wonderful philanthropy for 28 years. dineLA begins October 2-7 serving lunch courses from $16, $22 or $28 and three-course dinners from $26 to $44. If diners enroll an eligible American Express card by scanning QR code or visiting sync.americanexpress.com/foursquare to sync to foursquare. Load your dineLA special discount by going on foursquare and check-in. Use your synced American Express card between Oct. 2-7 and Oct. 9-14 at one of the participating dineLA restaurants and receive a $5 statement credit when you spend $21 or more. To learn more about these exciting culinary events, go to www.dineLARestaurantWeek.com. For more information on the Los Angeles Food & Wine event October 13-16, go to www.LAFW.com.